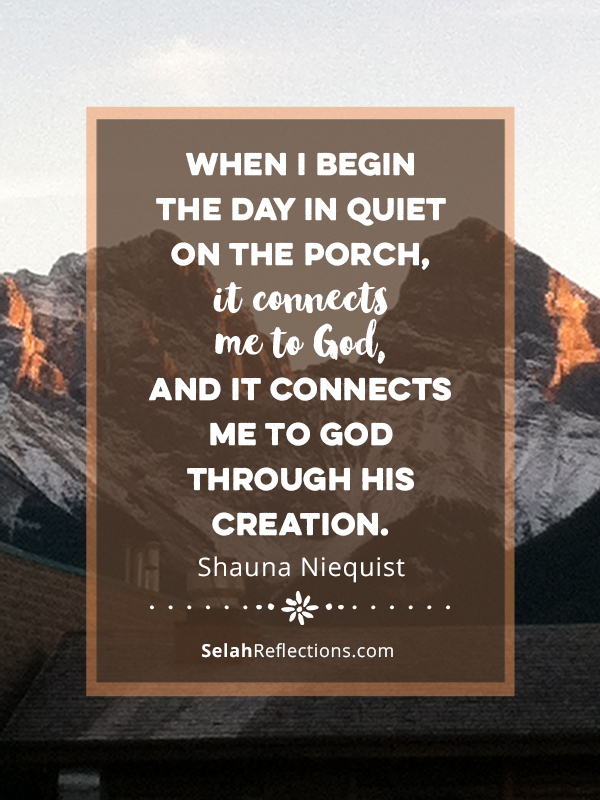 I’ve been reading a fantastic book called Present Over Perfect by Shauna Niequist. It’s a book that has spoken to me in many different ways. Especially her realization that she had become someone she didn’t recognize and missed who she used to be before, busyness, constant action, and noise took over her life. Adulting is hard, don’t you think? When we look at the budget, the meal plans, the school activities, the marriage and relationship building, or the raising of kids, we realize that life is hard. It is not always a bed of roses and all too soon we are running ourselves ragged trying to keep up. Shauna writes about how busyness lead to a high-stress lifestyle which even caused her to throw up on a regular basis. Uhm, NOT FUN. She lost sight of who she was as she ran through life at top speed. Her family suffered as they watched her become a driven, always on the go, needing to control everything wife and mother. She also realized that one of the reasons she kept so busy was fear of the silence. Of the thoughts and doubts, that would appear in the quiet moments. Makes me wonder if that might not be one of the biggest traps of busyness. When we are constantly on the go, we lose sight of who we are, and more importantly who we are in the eyes of God. We feel like we need to perform, be strong, and show that we can do it all. It’s as if we believe that showing vulnerability, asking for help, or saying no, is a sign of weakness, and that we will let someone else down. When we operate at such a high level of activity, it’s easy not to hear the Still Soft Voice speaking to us, nor our bodies and minds screaming for us to slow down. We can become a version of ourselves we don’t recognize in order to keep up. 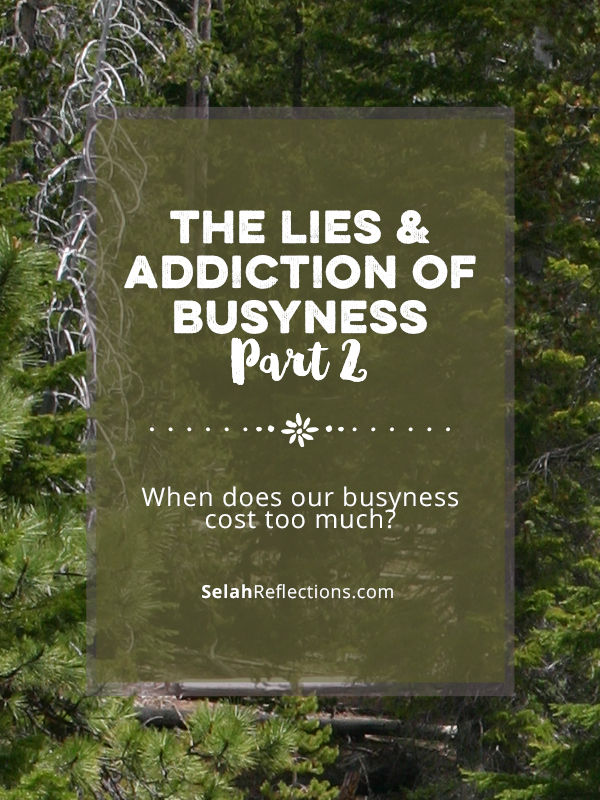 At what point does our busyness cost too much? There is no set answer on this. It will be different for everyone. Especially if you can see the good you are doing and the difference you are making. The trouble is, as Shauna describes in her book, that when we are running and always moving it may be we are doing so in order to fill a void. Or we work hard at keeping busy enough, so we don’t have time to face the areas of our lives that need attention. What will you find when you stop running 24/7? Of the emotions so close to the surface they may overtake us, and we will fall apart. If we add the word “No” to our vocabulary, others will think less of us and believe that we are not doing our part. That we are letting God down. This kind of fear is debilitating, no wonder we don’t want to face it! It’s a hard step because continuously living at a high level of stress, the adrenaline alone can be addicting. But it’s also addicting to work for the approval of others, to be social, to not be alone. But as we have talked about before, this addiction is also a lie. A lie that can destroy our self-image, and slowly steal away the person we used to be. There have been times over the past year as I look at my schedule and activities (or lack thereof) and wonder, where is the girl who loved to walk in the rain? The one who would jump at a chance to go camping at a moment’s notice, the one who grabbed a backpack, lunch, Bailey and headed out with her camera to go out hiking on a whim. I miss that version of me. Busyness has blinded me to these important parts of me. Shauna shares that it wasn’t until she began to see her identity in Christ that she began to see the cost of always being on the go. Once we see and understand this, we can begin to understand that our works are not what makes God love us. Slowing down is not something that happens overnight. It’s a journey of recognizing where we need to start saying no. And pay attention to when we need to rest, when we need to put our focus on health, and the needs of our family. In slowing down, we may feel vulnerable. We don’t usually like that, do we? It’s uncomfortable and risky to let others see that we are not superhuman and can’t do it all or have it all as society tells us we should be able to. It’s in this moment of realization where we can start to rebuild ourselves, recapture the parts of us we miss and address the need to work for approval. My copy of Present Over Perfect is full of underlines and highlight. I will be reading it again. When you look back at this past week, what do you see? Do you recognize that person? If not, what is one thing you could say no to in the coming week so you can slow down and find some stillness?